Today, NHL GameCenter will launch on Xbox LIVE* around the globe, giving Gold subscribers access to their favorite NHL hockey action right from their Xbox and just in time for the 2013 season to take center ice. Follow the Action from the 2013 NHL Season – Get real-time game scores, player stats and team standings. All Xbox LIVE Gold Members can also follow the action on and off the ice from the NHL VideoCenterTM. Watch the best goals, saves and hits from around the league this season. 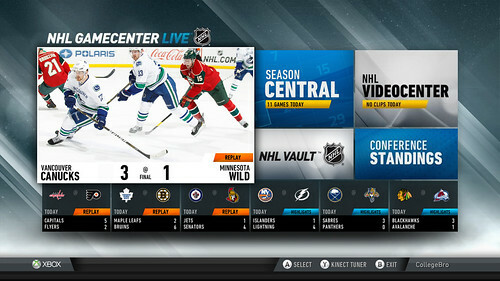 Live Games and Replays with NHL Game Center LIVE – With your NHL GameCenter LIVE™ subscription ($49.99 USD for the 2012-13 season), watch live, out-of-market games from the NHL regular season. Miss a game? Watch full-length archived games or condensed replays from this season and last. Every game with an HD-Quality Picture – NHL GameCenter delivers every game in a beautiful, HD-quality picture, and each broadcast gives every fan the option of the Home or Away audio feed. With NHL GameCenter on Xbox 360, you will feel like your team is the home team. Keep Up With Your Favorite Teams – NHL GameCenter on Xbox 360 lets you personalize the experience to get to the information you care about most. Select up to five teams to follow so you can be sure not to miss a beat on your favorite teams and players. Get the scores, player stats, schedule and live games, right at your fingertips. Season Central – A quick calendar view of the league schedule or just your favorite teams is a click away. Season Central is the best way to find out what games are on today, this week, or next month. Mini Guide – The Mini Guide gives you a quick preview of all of today’s action right at the bottom of your screen, and makes it easier than ever to switch between games. Split Screen – Keep an eye on the rest of the league while cheering on your home team! With Split Screen, you can watch two games at once and do just that. Watch live games on both screens or a live game on one while you catch up with a game recap on the other. You can control both screens independently, pausing and rewinding each separately so you never miss a second of the action. Classic Games from NHL Vault™ –Relive your favorite moments in NHL history with on-demand access to over 800 classic games from NHL Vault™. Watch some of the best Original Six battles from the 1960s or re-watch the best games from the Stanley Cup® Playoffs through the years. You now have the best way to watch these games on your big screen with Xbox 360. Voice and Gesture Control with Kinect for Xbox 360 – Focus on the puck instead of looking for the remote. Navigate through Season Central, or play, pause, and rewind that behind-the-back goal, all with the power of Kinect for Xbox 360. *Xbox LIVE Gold membership required. Subscription for NHL GameCenter LIVE is required for access to live games, replays and other content. . The NHL app will not be available on Xbox within the Nordic markets (Denmark, Finland, Norway and Sweden) due to an existing agreement in place between NHL and Scandinavian broadcaster, Modern Times Group (MTG). NHL games can be viewed instead via the Viaplay app, which launched on Xbox in December 2012.The Viaplay app is available immediately for download via Xbox LIVE and for further information, please visit http://viaplay.se/devices/xbox360.